After the article on not null arguments on public methods, let’s talk about class private methods. Checking the public method arguments is necessary to guarantee that methods callers are respecting the class API contract. On the contrary, private methods are not visible to outside code so there is no need the detect contracts violation. So, can we skip to check nullity of our private methods arguments ? Private methods are called by other methods from the same class so we (not class users) are responsible to guarantee that the methods are invoked correctly. If we pass a null argument to a private method which need a non null argument, this is a bug in our code and we should fix it. Joshua Bloch, in his famous Effective Java book, suggest to check private methods arguments using assertion. This is correct approach because assertion are usually enabled during development and test, while we are debugging our code, and disabled in production code. During the devolpment of the class (with assertions enabled) which uses the method, the assert will check nullity of the argument. 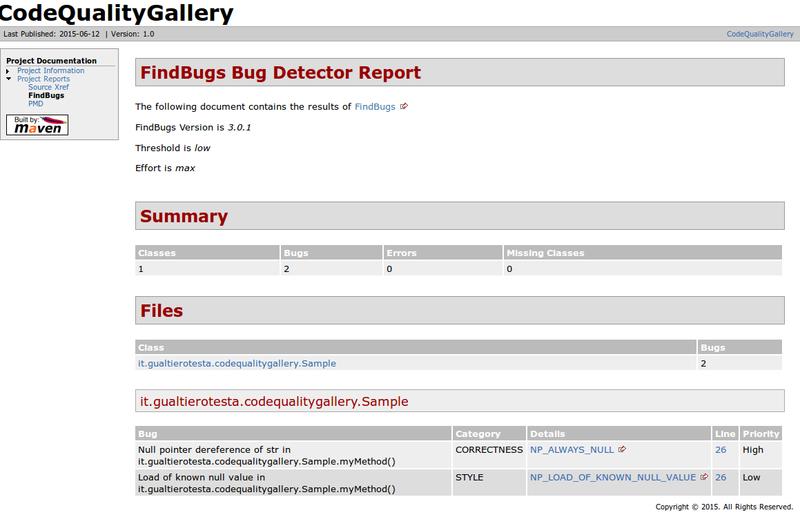 Assertion error will help us to debug and improve our code. This is the preferred solution: assert check run at execution time while Nonnull annotation guides the IDE to detect improper method calls. 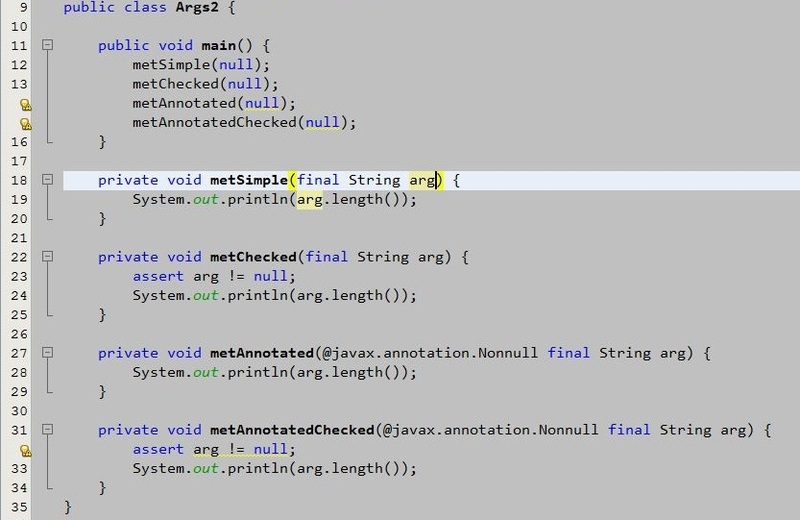 NetBeans detects wrong method calls at lines 14 and 15 thanks to annotations while it does not find problems on lines 12 and 13. 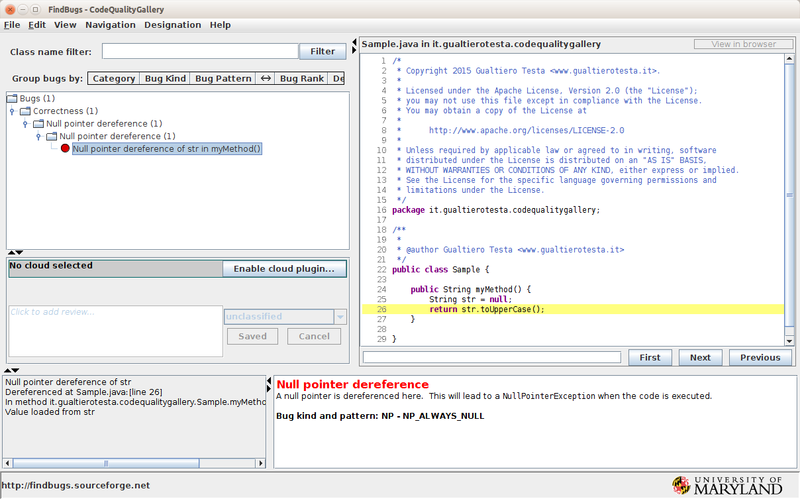 NetBeans is also reporting an “Unnecessary test for null – the expression is never null”) on the assert line.This is a false message because the annotation cannot guarantee that arg method is never null; I have opened a bug report. Most probably there is some code sharing between the tools. Eclipse users: please look at the comments on the my article on public methods. As Java programmer, one of my references is Joshua Bloch’s Effective Java. In this book, the theme 38 says we should always check the validity of the arguments on each method. if we call this method with a null String, we will get a Null Pointer Exception (NPE) at run-time. 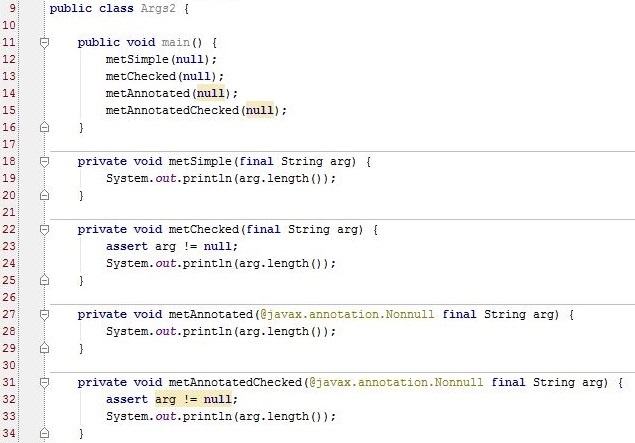 The check will assure us that the body of the method (here just a simple System.out.println but in real code will be more complex) can work on the argument arg without problems, knowing that the string arg is not null. Note: we should not use assert instructions to check public methods arguments. Reason is that assert can be disabled. There is also an old but still valid Java article on assertions on this. The nullity check is done at run-time so we need to work on testing side to have reasonable confidence that null condition (i.e the NPE) will not really happen in front of our customers. Can we also have some support during coding? I mean, from our fabulous IDE? Yes, but we need to help them, adding a “not null” annotation on the argument. There are several of these annotations but the standard is @javax.annotation.Nonnull. The @Nonnull annotation simply says: dear method users, do not try to invoke it with a null as argument. Important: the @Nonnull annotation is simply an annotation, a kind of hint for the tools. It is not a run-time check and it does not enforce or guarantee that nobody can call the method with a null argument. So our “if arg == null” check should stay there. The IDEs use these annotations (there are also others like CheckForNull) to perform additional checks (named “null analysis”) during coding. Not at run-time. These checks complements the run-time checks.